I have seen the dates listed and elsewhere but they may be out of sync slightly. In or around 1888 my Gt Grandfather lived at the farmhouse and was, I think, like an estate manager. He came there on recommendation from Westmoreland. At that time the mill was still, at least workable, and thanks to his horsewhip it remained standing. His son, my grandfather, told me that they had been warned never to play in there as it was dangerous.He and his brother were caught despite the warning and horsewhipped by their father. If I live long enough, it's full history will be published in a future volume... From what I recall, a diary of a former resident found in the Mill House stated that the mill was replaced by another on a slightly different but adjacent site in 1772. It's still very old though.. It definitely dates from 1772... It's built on a mill mound which probably hosted a succession of mills from probably earlier than the 15th century. 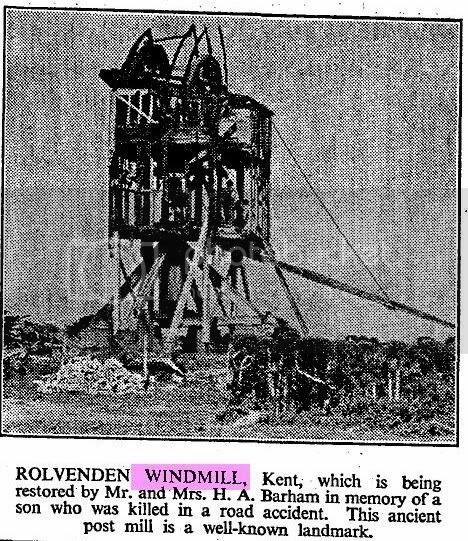 Rolvenden Windmill is Grade II listed, there has been a mill marked here since 1556 although this mill has a date of 1772 on it, it is thought that it is from 1596. The mill last worked in 1885. Over time the mill became derelict until 1956 when it was fully restored by Thompson’s, the Alford millwrights. The work was funded by Mr and Mrs Barham in memory of their son John Nicholas Barham who died in a road accident. It's in fine condition, still preserved as a memorial. Very tight to crawl around inside though. I think the mill has been rebuilt. Does anyone know what state this mill is in now?